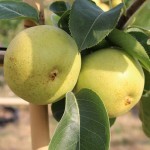 A yellow skinned Asian pear. It has sweet and tender, white flesh, ready in late August. The fruit can store well. It is partially self-fertile. Budded on semi-dwarf root stock. They need full sun and a well-drained soil. Obtain local advice for more cultural information.